Home > News and Videos > News > Congratulations, Mr. Lagasse! It's Orléans Honda's Win Your Winter Tires sales event, and we'd like to congratulate the contest's most recent winner: Mr. Lagasse! 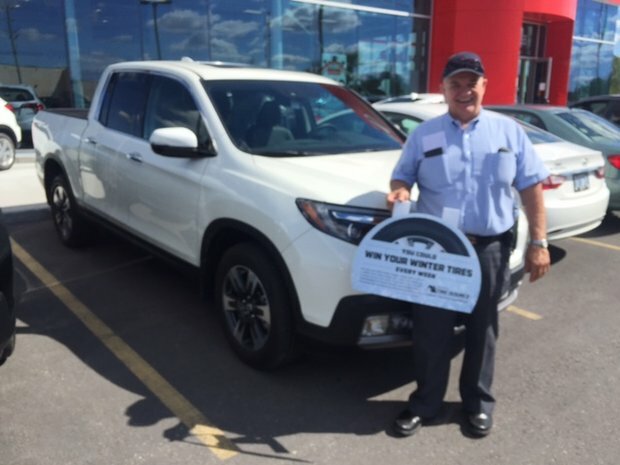 Each and every week at Orléans Honda, anybody who purchases, leases or finances a new 2016 Honda vehicle will be automatically entered into a draw to win their next set of winter tires, absolutely free! Hurry up though -- this contest only lasts until September 30th, so act fast, and get your new Honda vehicle today! Congratulations again to Mr. Lagasse. Your new 2017 Honda Ridgeline will rule the roads this winter with its new set of winter tires. For more information about this contest and how you can get involved in the future, contact us today at Orléans Honda!